Scouting plays an important part in the growth of many children. Scouts participate in a number of activities based around personal development, physical development, and skills development and also enjoy excursions beyond the Church/School. 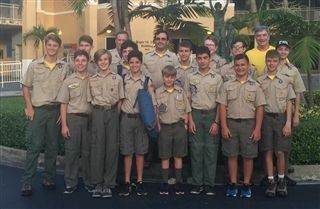 St. Thomas sponsors a number of Boy, Girl and Cub Scout troops as an outreach to the wider community, including a Boy Cub Scout Pack (Grades 1 to 5); a Boy Scout Troop (Grades 6 and up), and multiple Girl Scout Troops. A fellowship of relatives and friends of substance abusers who share their experience, strength and hope in order to solve their common problems, by practicing the Twelve Steps, by welcoming and giving comfort to families and friends of alcoholics, and by giving understanding and encouragement to the alcoholic. Monthly, no charge, one-on-one meetings on the second or fourth Fri (4pm-8pm), Sat (12pm – 5pm) and Sun (2pm – 4pm)are being offered by Br. Carlos Insignares, a Franciscan Friar. Please contact Br. Carlos at insig0164@aol.com.